The Wargrave Local History Society celebrated its 30th birthday when it met in November to hear Derek Brown, from the Consuta Trust, give us an illustrated talk about Consuta, the former Henley Royal Regatta umpire's launch. A full description of the Trust, and a set of photographs of Consuta can be seen on their website . This, Derek told us, was the story of the 'restoration of a Victorian lady' - although without smelling salts! The Consuta Trust was formed, with 6 trustees, in 1996 to take on the work of restoration. Graham Lindsay rescued a number of launches from the Thames, including Eva, which is now in the River & Rowing Museum, and had discovered Consuta in 1975. The aim was to restore it as a a working living museum piece, but although several photographs exist of it, there were no drawings or plans of how it had been built. The boat had originally been built in 1898, when the Henley Royal Regatta had a need for an umpire's launch. This had to be able to move quickly through the water whilst creating minimal wash as it followed the rowers. The boatyard of Sam Saunders, at Goring, were commissioned to design and built the vessel. Sam had been born at Streatley, and established a boatyard in the 1870s, and imported Canadian canoes. By 1896 he had run out of space, and so built a new boatyard above Cleeve Lock, which he called Springfield Works. It was here that he developed the first type of waterproof plywood. Instead of being clinker built, a boat made of this plywood would not need heavy ribs inside, and so could be light - and therefore fast. The plywood was constructed of 4 layers of mahogany, and between each layer was waterproofed calico fabric. The various layers were sewn together with 1/16" soft copper wire to form a ½" thick timber - the wire being recessed into the outer layer to leave a smooth finish. Sam Saunders called his patented method Consuta - from the Latin for 'sewn together'. The new boat for the Henley Regatta was the first to use the process. (Saunders later patented about 100 other inventions, eventually moving to the Isle of Wight, where his company built flying boats, pre-fab housing, and the first hovercraft). The new launch was about 51' long, with a beam of 7' 3", and powered in the only way possible at the time - by a steam en-gine - was said to be able to do 27½ mph ! The stern had a special tunnel design - another of Saunders' patents - that limited the swell very well. By the 1920s, however, it was in use by a boatyard at Chertsey, who installed a petrol engine - the steam engine being use to power machinery in the boatyard until the 1960s. When the BBC televised the Oxford v Cambridge boat race for the first time in 1949, Consuta was used to carry the heavy television equipment - a task it continued to do into the 1960s. In due course, it was used by Balcomb's of Surbiton for pleasure trips, and it was from them that Graham Lindsay had bought her in 1975. In the next 10 years or so, whilst stored at the Kew Bridge Engines Trust, restoration was started on the hull, by replacing some of the 40,000 stitches. The team at Kew also started to replace some of the rot in the hull. In due course the hull - weighing just under 3½ tons - was moved to near Hungerford, and much preparatory work was done. The work needed the skills of a specialist boatbuilder, and Colin Henwood, of Henwood & Dean took on the task, with the Trust's volunteers doing work such as stripping the paint off under Colin's supervision. The hull had opened up to about 8' 6" wide, and so the first task was to restore the lines of the boat - which Colin did with the aid of special formers. A marine architect was then able to make a set of proper working drawings. Special formers were also made so that the hull could be inverted for some of the work to be done. An enclosure had to be made to enable the workshop temperature to be raised to cure the resins injected into cavities in the timbers. To make sure the sides stayed rigid, lengthwise stiffeners were added, which also act as seats. An orthopaedic surgeon who was a member of the Trust, made a mock up of the boiler and engine, so that Colin Henwood could make the deck beams etc, and then many thin layers of varnish were applied to the hull and the teak deck cover boards. Meanwhile, the boiler Graham Lindsay had designed was being made in Yorkshire - although this ended up being rather heavier than planned. Fortuitously, the original engine has been installed into the hull, and the two units were tested and connected up by the team at Kew. The Trust had by this time become a registered charity, and was able to get a grant of £38,000 towards the restoration costs from the Heritage Lottery Fund in 2000. Eventually, Consuta was ready for the water again, and so she was brought to Bushnells' Wargrave yard in October 2001, when successful steam trials took place. It then had to be tested by the Environment Agency to earn the blue pennant which permits it to exceed the official speed limit of 5mph (allowed as it produces little wash). 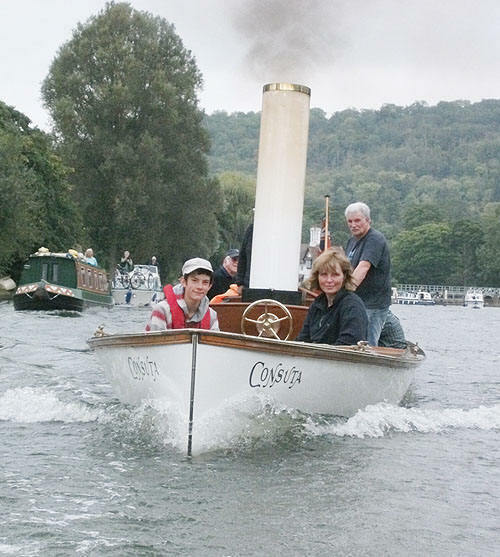 And so, in the summer of 2002, the Trust's aim was achieved, and Consuta once more was back on the Thames for the work for which it was built - as the umpire's launch at the Henley Royal Regatta. The next meeting takes place on Tuesday, December 13th when we will hold our Christmas Party, whilst on Tuesday, January 10th, John Harrison and Rob Needham will recount the history of Wargrave Bells and Bell Ringing.